If you are a regular reader of The Moonstone, you will recognise the influence of the Natural Magic feature on this recipe. For those of you not in the know, Natural Magic is a monthly feature that looks at the magickal uses and correspondences of items from the natural world, specifically, trees, flowers, herbs, fruit, vegetables and spices. In the last issue, we specifically looked at the spice rack and one of our three correspondences was ginger, a spice associated with warming, winter food because of its ability to keep the cold at bay. Melt butter, sugar, treacle and syrup over low heat. Whisk the eggs and then combine with the milk before adding a bit at a time to the melted mixture. Sieve the dry ingredients and then pour on the liquid mixture and combine well but do not beat. Pour into a cake tin that has been greased and lined. Bake for 45 minutes and then cover the top with greaseproof paper for the remaining 30 minutes or so. Insert a skewer or knife into the centre to ensure that the cake is cooked all the way through. Allow to stand for 5 minutes in the tin after removing from oven and then carefully take it out of the tin to cool on a wire rack. When cool wrap in fresh greaseproof paper and store in a tin; stored properly this cake should not only keep well but improve with age. Please note this disclaimer: I am not responsible for how your cake turns out! Many things can affect the final product, even if you follow the recipe down to the very last grain of flour, such as your weighing scales and even your oven. 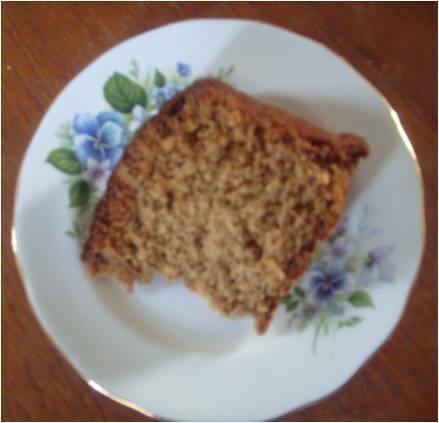 After two days, the ginger cake had a nice, delicate flavour. However, both the taste-testers (also known as my family) and I agree, a few more days left in the tin should give it an even stronger flavour. So, your personal love of ginger should dictate how long you keep it before eating. This entry was posted in Kitchen Witchery and tagged ginger cake, ground ginger, kitchen witch, magickal food, recipe, recipes. Bookmark the permalink.